When millionaire Jethro Dumont disappeared into the mystic fastness of Tibet, the world thought him lost forever. But he came back with a sacred mission: to eradicate evil and all suffering that originates from wickedness. Donning the emerald robes of a Tibetan monk, Dumont became The Green Lama, a relentless scourge of the Underworld. Aided by ordinary people from all walks of life, guided by the mystery woman known only as Magga, The Green Lama employs esoteric methods to conquer crime. 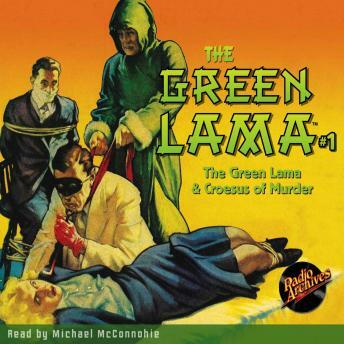 In this exciting premiere Green Lama audiobook, his first two exploits are presented. In The Case of the Crimson Hand, he takes on a vicious super criminal. And in the second, Croesus of Murder, he plunges into the Everglades to confront a criminal Furher intent upon enslaving America.